This controller is utilized only on the unwind end of the machine. Not necessarily. 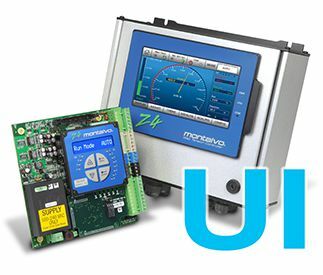 The Montalvo Z4-UI Controller is a hybrid controller that utilizes analog signal processing for the actual tension control loop, while utilizing a digital interface for programming that simplifies programs and offers many optional features. Analog signal processing is real-time. Digital signal processing is limited by processor clock-speed. While modern processors are extremely fast, none are as fast as analog. That being said, digital processing may be fast enough for many applications. Montalvo offers a fully digital load-cell based system with our S4 system. If this controller is controlling a dancer, why do I need load cells? A well designed dancer system with a good dancer controller is an excellent method of managing web tension. However, no dancer system can tell you what your actual web tension is. The tension can be inferred, but without load cells, actual web tension cannot be known. In order to improve process consistency from job to job, shift to shift, and if a wide range of products are processed requiring different tension values, web tension measurement with load cells is the only way to ensure consistency. Fortunately the Montalvo Z4-UI has inputs for load cells, and can provide the actual tension reference for process consistency, and the storage advantages of the dancer system. Will this controller set the loading on the dancer cylinder? Yes, the Z4-UI can effectively become a dancer control system with setpoint control. By adding a secondary I/P (current to pneumatic) converter to the system, the operator can adjust the tension setpoint to calibrated tension values and the controller will adjust the load to the dancer loading air cylinder to provide the appropriate tension level. No other dancer controller on the market can offer this level of functionality. Load cell calibration should be conducted at least annually, unless there are indications such as failure to return to zero, that may indicate more frequent intervals. If the system needs more frequent calibration than twice yearly, it could indicate a problem with the load cell system, either mechanical or electrical.